A fine spring day greeted those that arrived to take part in the CBOP Rugby League 9s event at Puketawhero Park. 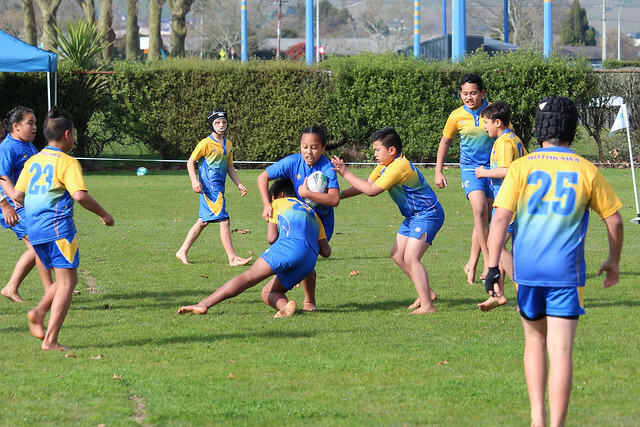 13 teams from 12 CBOP schools took to the fields with energy and enthusiasm with TKKM o Ruamata coming out on top taking out the championship spot for 2018, they also finished off the day with an awesome haka at prize giving. Westbrook and Rotokawa Schools were not far behind as the runners up and 3rd placed teams. Praise goes to the great coaches, managers and spectators and well done to all those who took part. A big thank you to the RBHS League players and Dougie who refereed for the day, NRL staff Tony and Hamana and Exia our in-house first aider who made the day possible.